Urban development and redevelopment present a host of challenges - not the least of which is managing site stormwater runoff. In a northern suburb of Vancouver Island’s beautiful city of Victoria, BC the stormwater challenge was met and bested through the application of both passive and active chitosan stormwater treatment. The Uptown Shopping Center, Phase II, project in Saanich, BC involves demolition of existing structures, construction of 800,000-square-feet of retail and office space, as well as, large concrete pours to construct a parking garage serving as an expansion of the existing shopping center. Stringent Municipal and Provincial water quality requirements made it clear that stormwater would have to be treated to reduce turbidity and to neutralize pH prior to discharge. After reviewing various treatment approaches the site contractor, Chew Construction Ltd., led by Sr. Project Manager Tim Johnson, selected chitosan passive pretreatment followed by active treatment for turbidity reduction. Carbon dioxide was also added for pH remediation. 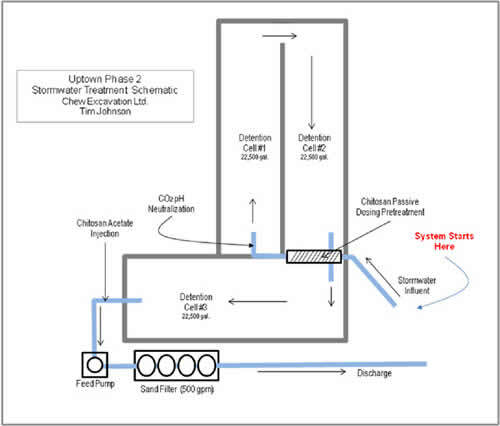 The Treatment System: Passive pretreatment with ChitoVan™ is a simple process where the dirty stormwater is pumped through a pipe or hose that contains a fabric cartridge full of chitosan lactate flake. When wet, the flake is immediately converted into a bio-gel that slowly and evenly dissolves into the water through the cartridge fabric. The cartridge is held in the pipe with a strap, carabiner and eye bolt. Once the dissolved chitosan lactate mixes with the turbid water, the tiny dirt particles in the water coagulate/flocculate. The water is then directed to the settling basins where the flocculated sediments have time to drop out of suspension (see the Pretreatment Settling Basin above). This pretreatment step considerably reduces the turbidity and allows the polishing sand filter unit to operate at a high efficiency. Each 2-pound chitosan lactate cartridge pretreats approximately 150,000 gallons of turbid water at a dose rate of about 1.6 ppm. At this point the water has been pretreated for turbidity and the pH has been neutralized. In the detention basin, the treated water has a residence time of about 2.25 hours for solids settling, when processing at 500 gallons per minute. After pretreatment and settling the turbidity is reduced by up to 90 percent. As the clarified water flows to the end of the detention pond, the water is filtered through a 4-pod sand filter rented to the project by Baker Corp. The sand filter was selected to remove the remaining fraction of suspended sediment from the pretreated water to ensure the lowest turbidity possible. In a letter to Dungeness Environmental Sr. Project Manager Tim Johnson said, “Tests have consistently shown effluent turbidity levels at less than 1 NTU and pH within a narrow range of around 7.0”. When the turbidity is elevated (during heavy storm events) a small amount of ChitoVan chitosan acetate liquid is sometimes metered into the water just upstream of the sand filter which greatly enhances the filter’s effectiveness. A typical chitosan dose rate in front of the sand filter is 1-2 mg/l depending on turbidity. At an average dose rate of 1.5 mg/l a 275-gallon tote of 1 % ChitoVan chitosan acetate will treat about 2 million gallons of water. Lessons Learned: Given today’s construction stormwater quality regulations, treatment is not just an option – it is critical to the success of the overall construction project. This is especially true when constructing in areas prone to wet weather and discharging to fish-bearing streams. Never the less, cost is always an issue and today bids can be won or lost on the estimated cost for water treatment alone. By teaming with Dungeness Environmental (technology experts and supplier of ChitoVan chitosan products) and Baker Corp. (supplier of the sand filtration equipment), Chew Construction has been able to keep treatment costs minimal while maximizing performance. This is not an easy thing to accomplish considering the pressure from the project owner, the local community and overlapping regulatory agencies. This project demonstrates that with good planning, and some help from the experts, a contractor can safely treat stormwater to exacting standards using chitosan technology. Also, as an unplanned benefit - Chew Construction has developed a new environmental skill set that will serve them well into the future.